Audrey Fallope's business-magical shoes caught my eye at A Little Market'stemporary boutique a few months ago. 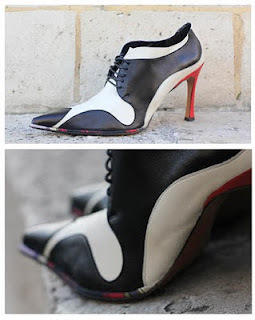 The shoes radiate both professional sensibility and girly style, a creative and rare pairing with stellar results. It was a great pleasure to discover this line of shoes, and an even greater one to meet their maker at ALM's boutique. Audrey introduced herself and told me a little bit about how she came to find and love this metier. I'm honored that Audrey agreed to share her story with Paris Paysanne because she is a shoe-in for one of my favorite Parisian producteurs. Audrey's passion for shoes started at a young age and was in part inspired by her own father's respect for fancy footwear. Audrey described her dad's weekly shoe waxings, "my father wore beautiful shoes, and every Sunday he took them out to wax and buff them. He could spend hours shining them, making them sparkle." This masculine influence is apparent in Audrey's shoes, which are adorned with mensweary touches such as tassles and little leather laces. While studying at art school, Audrey began designing shoes and found her calling. A helpful professor indicated which classes she would need to take in order receive the proper training for her dream job and a little over a year later Audrey was ready and eager to design and assemble her own shoes. "It's great," Audrey said of her professsion, "sometimes it feels like I'm dreaming, I'm so happy. I love knowing that I'm capable of designing a shoe and then being a part of every step of its creation, from A-Z. It's thrilling!" Audrey is deeply invested in every aspect of the shoe-making process, in fact it's one of her favorite parts of the job, "I really love the work involved in the creation and conception of a shoe" she explained, listing the various responsibilites in the process of shoe making, which include finding the materials, deciding on what form (and heels) the shoe will take, and creating interesting mixtures of shapes and colors. Her attention to detail and the obvious fun that Audrey has contrasting colors and styles make these shoes truly unique. For Audrey, the one-of-a-kind element is among the most compelling arguments for buying hand-made goods. Buying artisinal goods, Audrey explains "is recognizing the handiwork of others, the production of a one-of-a-kind object means that you won't be wearing the same thing as your neighbor...it will be designed personally for you and for your tastes and needs." 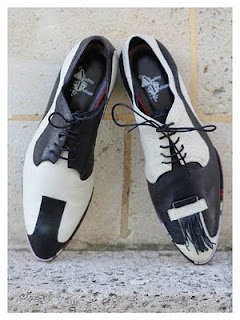 Buying Audrey's hand-made shoes is not only a way of distinguishing yourself from others,-it's also a way of rewarding a special kind of work and talent. When we support artisans, Audrey argues we "recognize the beauty of the acts and knowledge of people who dedicate a great deal of time to creating beautiful products that will improve over time." If you want to get some orginal Audrey Fallope's on your feet, check out her site where you can see more pictures of her shoes and get information for ordering your own personalized pair!